Birkbeck B30, WC1E 7HX, near Gower str. 16:00-17:00 Mixing and Anonymous Transactions in Bitcoin (cf. paper). recent book by the speaker. Video recording of the talk. MPEB1.04 17:30-19:00 Guangyan, Song (PHD candidate) will present some software for bitcoin blockchain explorations. 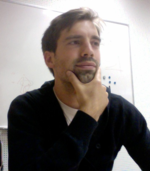 Then Dr Nicolas Courtois will speak on ECDSA and bitcoin elliptic curve. cf. slides on ECCs and some overview slides on bitcoin storage and more slides on bitcoin key management. MPEB1.03 16:00-17:00 UCL ACE Seminar series: Dr Nicolas Courtois will speak on ECDSA and bitcoin thefts followed be A SECOND SEMINAR by Dr Luca De Feo on elliptic curves and graphs formed by their morphisms. Topics: A paper on ECDSA bad randoms and bitcoin, some overview slides and slides about bitcoin key management. Topics: Recent events, how to steal 100,000 USD. Torrington Place, WC1E 7JE 16h-18:00 Bitcoin contracts – digital economy without lawyers? Topics: cf. video and these slides. Jingxian Luo, UCL, his later thesis / slides. Topics: selfish m., 2ble-spend, 51%, displacement etc. Topics: Bitcoin vs. equities trading etc. Topics: What is money? What is a currency? . Topics: About this seminar, what is Bitcoin?, who runs bitcoin?, is it money? Shiva Bissessar, University College London and Pinaka tech.